I've cleaned up the kitchen, brushed my teeth & washed my face & now I'm in my chair watching N. E. vs. Chicago & Chi. is ahead by 5 with 2 min. to go. I'm hoping Chi. can hang on. This aft. I watched Pitts vs, Atlanta & it ended in a tie. Pitts couldn't hold the lead. Last Friday we went to Erie -- it was a beautiful day & we enjoyed ourselves. First we had an early lunch at the Olive Garden. We love eating there. We got a good start on our Christmas shopping. It was busy already -- people spending their Christmas Club checks. Before we left for home we stopped at McDonald's to use the restroom & get something to drink. I got coffee & their cookies -- like animal crackers & they are good with coffee. 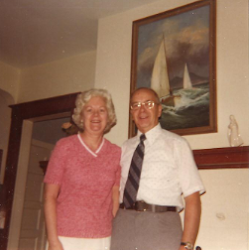 Barb had taped some old favorites of my day, both popular & classical & I enjoyed the music. I mentioned I had 2 books to read & both were so good. 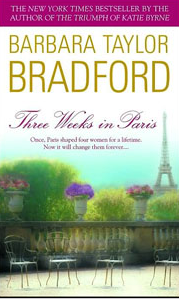 Three Weeks in Paris was fun to read. 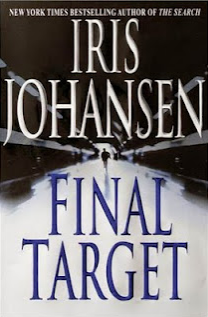 Final Target was so good but different. More intrigue & excitement. Iris Johansen has written many books so I'll have to read more of them. There are 28 seconds left in the game & N.E. just got a TD. It's been a long 2 min. It always is. The house across the street went up for sale last Saturday. Guess Frank doesn't want to live there all alone & Faye won't be back. Wonder how long it will take to sell. They've done a lot to the house but the landscaping needs to be updated. I got the bathroom cleaned this A.M. Had the Bible Study at church at 11 A.M. Because of that I didn't wash the bathroom floor -- it doesn't need to be washed weekly. Also got the downstairs dusted so I didn't get too far off schedule. When Barb came home this afternoon she said "I have something to show you." It was a receipt for a new mattress set that will be delivered on Saturday A.M. She has been talking about buying one & finally did it. Back to this A.M. I didn't stay at church for coffee but came home to fix Dale his lunch because this is his long day & I like to have a good lunch. I don't do that every time -- he likes the frozen pot pies & they are filling. This A.M. someone was looking at the house across the street. Barb thinks it will go fast. They have done a lot of work on the house & the wife is very artistic so I'm sure all is nice. A couple of years ago it was one of the houses to see on the Women's Club "House Walk". Sheila went & said the house was very nice. We have a new heating unit at church. It was too warm in church last Sunday. They were back on Monday to adjust the system. This letter will be mailed a day early. Reason: Last Fall Sheila won a trip to 2 for a weekend in New Orleans At a cancer doing. She bo't a 10.00 ticket &^ never tho't her name would be chosen. So she & her husband are leaving on Fri. So my appt. is for 8:30 Thurs A.M. So it will be a rush to get going. She knows I'm an early rise so I wouldn't mind an early appt. Kim won't be coming for dinner Thurs. nite -- she is going to a painting class. What kind Lar didn't say, but we'll find out tomorrow nite. 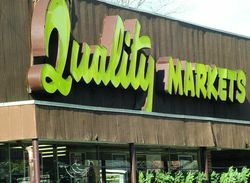 At Quality they keep track of the money spent on groceries & Tues. last, I got a $50.00 gift certificate for spending a certain amt. of money. So I have $50.00 extra to spend on groceries Something I wouldn't ordinarily buy. When I read about the dessert bar you passed up, I thought I'd probably sample 2-3 desserts. The 5 Forks Restaurant has the Food Bar & we took 2-3 desserts the 2 times we were there. But they were small pieces. They were too good to pass up. Lynn put off taking Scott to the Dr. He told her he couldn't hear & wanted a hearing aid. He has an inner ear infection & it has affected his hearing. I h ope it will be OK after he feels better. he seems to have a lot of ear trouble. I'm sure you'll be happy when all the budget meetings are over & that you got most of what you hoped for. Bert comes home late Thurs. nite. Barb has been painting one bathroom. She needed to do a lot of sanding to smooth it out. Barb saved the work to just before Bert comes. So she has been busy this week. Never put off your work. At least that is what I tell myself. More next week.